Queen Boadicea of the Iceni tribe. 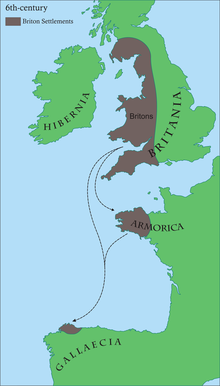 The Britons (also called Brythons) were the people who spoke a Celtic language known as Common Brittonic. They lived in Great Britain during the Iron Age, Roman Britain and the Sub-Roman period following the Romans leaving Britain. After the Anglo-Saxons arrived many of the Britons were absorbed into the new culture and became English. Others withdrew into Wales, Cornwall and southern Scotland. Still others left Britain for Brittany. In about 330 BC, Pytheas, a Greek explorer began a voyage in which he discovered the British Isles. In 326 BC he landed and gave the island the name Prettanike or Brettainiai. The name became Britain. When the Romans conquered Britain in 43 AD, they called the people living there Brittanni (also spelled Britanni). They were also aware of their tribal identities. In their histories the Romans said of them "they are a people harassed by hosts,[a] who receive political exiles, who rebel, and who are among the remote peoples of the world." Monks writing in the 4th and 5th centuries also called them Britanni. Some used the term Britto. The Anglo-Saxon Chronicle contains an account of the land and the people of Britain. ""The island of Britain is eight hundred miles long and two hundred miles broad: and here are in the island five peoples: English, Brito-Welsh,[b] Scottish, Pictish, and Book-Latin." The Welsh scholar John Rhys first used the terms Brythons and Brythonic. He wanted a more specific terms for the people of Wales and the Welsh of Cumbria and Cornwall than just the word Britons. From the Iron Age onward, the territory inhabited by the Celtic Britons changed considerably. At first it was divided among a variety of Celtic tribes. Before the Romans came, they occupied most what is now the country of England. Celtic tribes in pre-Roman Britain. The Brigantes - Controlled what would later be much of Northern England. The Carvetii - Located in the area of the Solway Plain just north of Hadrian's Wall. The Corieltauvi - They lived in what is now the East Midlands. The Cornovii - Lived in what is now the West Midlands. The Parisii - Occupied what is now East Yorkshire. The Atrebates - Occupied what is now West Sussex, parts of Hampshire and Surrey. The Belgae - Were in and around the county of Hampshire. The Cantiaci - Lived in the modern county of Kent centered on Canterbury. The Catuvellauni - Occupied what would later be Hertfordshire, Bedfordshire and Cambridgeshire. The Durotriges - They occupied the later area of Dorset and western Hampshire. The Trinovantes - Controlled Essex and parts of Hertfordshire and Middlesex. The Regnenses - They occupied what would be Sussex and Surrey. The Damnonii - Occupied what would be Cornwall and Devonshire. The Deceangli - Their territory included north-east Wales. The Demetae - Gave their name to Dyfed; also inhabited modern Pembrokeshire and Carmarthenshire. The Dobunni - Their territory included Northern Somerset, Bristol, and Gloucestershire. The Gangani - They occupied much of northwestern Wales. The Silures - Their territory included modern Monmouthshire, Breconshire and Glamorganshire. ↑ war bands; large multitudes. ↑ Britons absorbed into the Welsh culture. This page was last changed on 20 August 2015, at 22:12.